Cardi B continues to rise at an historic pace. 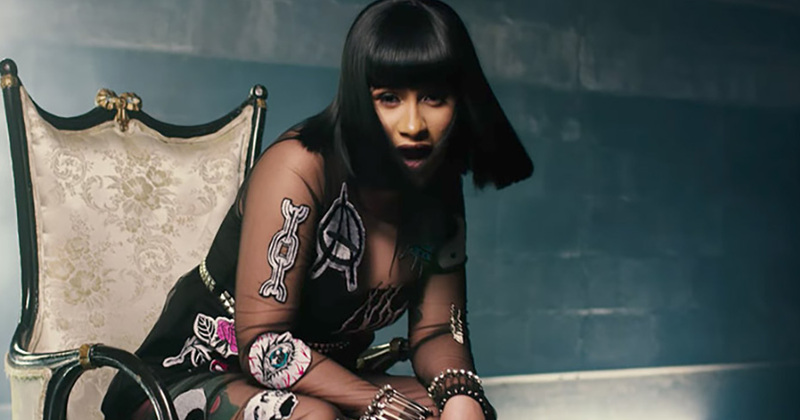 The Bodak yellow rapper who recently became the first woman with five top ten hits on the Hot R&B/Hip-Hop songs chart, overtaking Beyoncé's previous record of 4 ... now has another feat to celebrate. According to reports by TMZ, Cardi B has just inked her first movie deal. No word on what the film is called or on how much she'll be getting for it, but we do know her services won't come cheap. The singer begins filming in March so fans won't have to wait long for details to emerge. Bardi recently made history by surpassing Queen Bey to become the first woman with five simultaneous hits on billboard's Hot R&B/Hip Hop songs chart. Her collaboration with Bruno Mars, Finesse is currently the number one song on the chart, while her assists on G-Eazy's No Limit with A$AP Rocky sits at No. 3; Migos' Motorsport which she's also featured on is at No. 4, Bartier Cardi at No. 7 and her breakout hit "Bodak Yellow" at No.. 10. An overjoyed Cardi celebrated the news on her Instagram. Drake and Kendrick Lamar are the other two acts to ever reach this milestone.